Although the Grizzly Engineering Disc Seeder is in its final stages of testing it is poised to add an entirely new dimension to the Disc Seeder market in Australia. The new hydraulic spring assisted parallelogram disc seeder’s innovative features are set to include a seed placement system that conserves moisture and an automatic depth-sensing system. 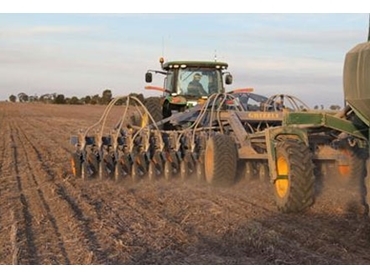 The new Grizzly Disc Seeder has been designed to reduce soil disturbance and preserve moisture levels while carefully considering of Controlled Traffic Farming (CTF). The new Disc Seeder also has an adjustable toolbar that enables inter row sowing for different spacing in controlled traffic operations of 30 feet, 35 feet and 40 feet models. Grizzly Engineering is in the final phases of testing with the new Grizzly Disc Seeder prototypes.